The Grappa Massif consists almost entirely of sedimentary rocks, which originate from the disintegration of other pre-existing rocks. Erosion leading to the production of fragments and debris of various sizes, and the waters of streams, glaciers and the wind carry them, and they accumulate in depressions in the earth's surface. The debris deposited are known as loose sediment (because they are tied together). Over time, sediments build up on each other, to form bodies very thick; older ones are buried by subsequent and subjected to increasing loads. The great pressure of overlying material causes the expulsion of the water that circulates between the loose sediment, and consequently, there is the gradual compaction of the material. The water expelled releases minerals than it contains, making it act as a "glue" on the loose sediments that combine together; everything happens in a very long time, the order of millions of years. The set of chemical and physical processes that transform the sediments into sedimentary rocks are called compact diagenesis. Sedimentary rocks are fossils of shells and skeletons of marine animals and plants, of lake or land. 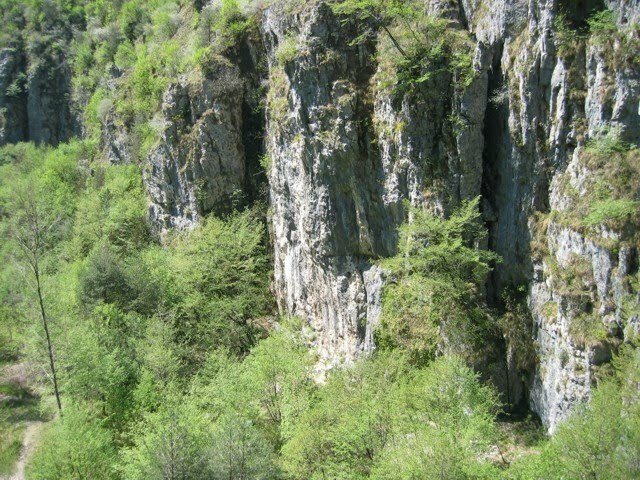 The rocks present on Grappa mountains are organogenic sedimentary, formed in the sea by the accumulation of debris and remains of animals and plants. In detail we have the following types: Main Dolomite, gray and white limestone, oolitic limestone, red Ammonit, harrier, red flakes, marl. These types of rocks were formed in three geological periods: Triassic, Jurassic, Cretaceous. The Trias in Grappa is the oldest formation that consists of huge masses of dolomite, poor in fossils. The Jurassic, represented in the three divisions of the Lias, Dogger and the Malm, consists of dolomite and limestone, more or less rich in fossils. The Cretaceous, represented in the two subdivisions of upper and lower Crete, is made up, the first of limestone, forming a white marble (Biancone Veneto), according to fossil-rich limestone and clay forming a scaly red marble (Scaglia rossa del Veneto). In the lower part of the original Valley of Santa Felicita is present the gray limestone of the Lias, the middle part of it consists of white limestone Dosiger, giving rise to steep slopes and steep covered with dry grasslands. Going up to Col Campeggia is present the red ammonitic of Malm and the Cretaceous Biancone.